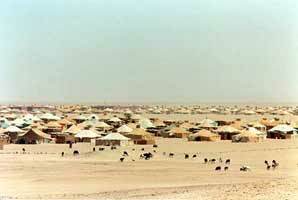 Tindouf : Human rights, no idea? At the time when the Sahrawi activists work openly to defend human rights in the Moroccan Sahara taking advantage of the solidarity of the wide Moroccan associative network and of the symbolic capital accumulated by the latter during the decades of militancy and also of the undeniable opening of the Moroccan society, and of the State afterwards, to everything relating to the sensitive human rights sector, the issue of the same human rights remain a major concern on the other side, that of Lahmada camps on the Algerian territory, despite the calls and the denunciations of the NGO and the international institutions, and mainly UN institutions, HCR at their head! Concerning this subject, as well as others, Algeria ignores it as if this does not concern it unduly, while it shelters the separatist movement, protects and promotes it at the international scale, via its diplomatic representations abroad, and through seizing all the political, sportive and cultural events in order to brandish the banner of the “poor Sahrawi people” , “despoiled of its rights”, while closing eyes on the exactions, mistreatments, systematic violations of the Polisario in Tindouf camps, as well as on the slavery practices, smuggling and treatment of sub-Saharan migrants. Practices stoically undergone by the population of the sequestered of Tindouf, shut in by force wealth camps, since more than 33 years, without having a say in the matter, without speech or movement freedom, without solution or hope. Even the international aids of the international institutions and NGOs are systematically misappropriated for the benefit of the dubious Polisario leaders and those close to them who quietly sell them in the sub-Saharan markets. Beyond the despair of the sequestered populations in the camps of shame, the question is to know where are the defenders of the Sahrawi human rights? Why are they absent in camps? Due to the terror practiced in camps? Certainly. But why don’t they manifest in Algiers, Nouakchott or Madrid ? Why do they act exclusively in cities and the main districts of the Moroccan Sahara and not elsewhere!? Human rights constitute an inseparable whole, isn’t it jurists? Why the Polisario propagandists, and their known defenders conceal such a humanist and ethic approach, before being political and legal in their self-determination project ? The self-determination that they sing doesn’t it start with the respect of human rights in camps? Can we ask a simple question to the camps “inhabitants” : do you want to stay or go to Morocco, or go to another place of your choice? All the problematic of the camps called the problematic of refugees lies here! The UNO should, via its specialized institutions, make a census of the camps population and ask them such a question in order to clarify a confused situation having lasted too much! These questions and others deserve reflection and an appropriate answer and cannot indefinitely escape to the universal conscience of the international community.